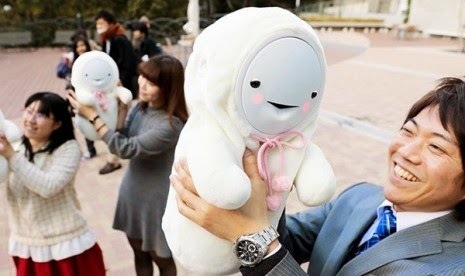 To eliminate the loneliness of the elderly who live alone, Japan will market the babies robot require constant attention from the "parents" like a newborn baby. As quoted from Asahi, baby robot which will be marketed on January 21, 2015 was developed jointly by Masayoshi Kano, professor of robotics at Chukyo University and Nagoya Seisakusyo Togo company based in Togo, Aichi Prefecture. "Smiby" Robot has a sensor that is attached to react when the "parent" to lull them into a hug. When Smiby be in the arms of the parents, the robot was programmed to start laughing. However, when left alone in a long time, the robot was going to cry. If parents abandoned them longer, the robot will fall asleep. When Smiby swung too tight, the robots will cry. Tears are indicated with a blue light, while her cheeks would turn into pink when they are happy with the attention and care that is poured out by parents. Smiby robot has 500 types of sounds and sound depending on the situation and taken from a year-old baby sound recorded researchers within six months. The robot is made of plastic and silicon by using technology to produce resins Togo Seisakusyo sophisticated spring car. When the battery is full, the robot can work for ten hours.